What will be the legacy of President George Walker Bush? In this fascinating, timely book, Glenn Greenwald examines the Bush presidency and its long-term effect on the nation. What began on shaky, uncertain ground and was bolstered and propelled by tragedy, has ultimately faltered and failed on the back of the dichotomous worldview—good versus evil—that once served it so well. In A Tragic Legacy, Greenwald charts the rise and steep fall of the current administration, dissecting the rhetoric and revealing the faulty ideals upon which George W. Bush built his policies. 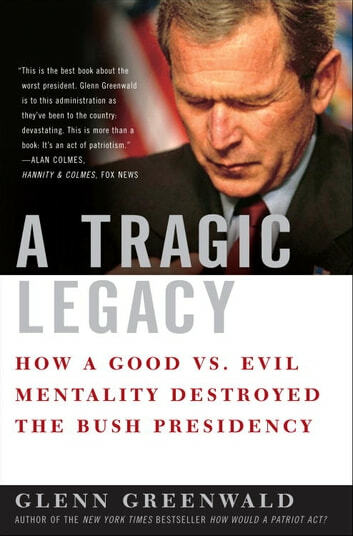 On September 12, 2001, President Bush addressed the nation and presented a very clear view of what was to come—a view that can be said to define his entire presidency: “This will be a monumental struggle of good versus evil.” Based on his own Christian faith and backed by biblical allusions, Bush’s worldview was basic and binary—and everyone was forced to choose a side. Riding high on public support, Bush sailed through the early “War on Terror,” easily defining our enemies and clearly setting an agenda for defeating them. But once the war became murkier—its target unclear, its combatants no longer seen in black-and-white—support for Bush and his policies dropped precipitously. Glenn Greenwald brilliantly reveals the reasons behind the collapse of Bush’s power and approval, and argues that his greatest weakness is the same rhetoric that once propelled him so far forward. Facing issues that could not be turned into simple good versus evil choices—the disaster of Hurricane Katrina, his plans for Social Security “reform,” and, most ironic, the failed Dubai ports deal—Bush faltered and fell. Now, Greenwald argues, Bush is trapped by his own choices, unable to break out of the mold that once served him so well, and indifferent to the consequences. A Tragic Legacy is the first true character study of one of the most controversial men ever to hold the office of president. Enlightening, powerful, and eye-opening, this is an in-depth look at the man whose incapability and cowboy logic have left America at risk. Does State Spying Make Us Safer?